Viewing a thread - Question about the 55-56 Interior door handle springs. Question about the 55-56 Interior door handle springs. 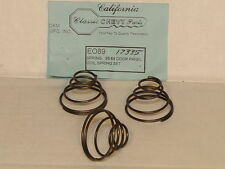 Subject: Question about the 55-56 Interior door handle springs. Location: Lower Mainland BC I am installing my "restored" (more like "betterfied" (to make better than you find it)) door panel today. I have everything in place and ready to go. Then a thought hits me. Why do I need the springs? The PN is 1695 431 as found in section 23-14-21 of the 55-58 Mopar Parts Manual (and the diagram below). 1. Are they really needed? I don't see the purpose for that much back pressure on the door panel. 2. If they are needed, why are they shown "pointy" end out, i.e. to the back of the door panel? Pointy end in, with the wider end at the back of the door panel, makes more sense to me. Subject: RE: Question about the 55-56 Interior door handle springs. Location: Invermere B.C. Canada - Rocky Mountains In a stock situation the spring pushes on what other makes call the escutcheon that covers/hides the handle retaining pin or clip. If you don’t need it don’t use it. Here are two photos, both without the springs behind the panel. Not sure what I will do in the end. Location: Michigan The springs go on the outside of the panel. They push it back from the handle so you don't mar it up cranking the windows up and down. So the big end goes against the door panel. the small end goes against a washer that is very thin and that presses up against the handle to ensure smooth operation. Beltran - 2017-08-07 9:17 PM The springs go on the outside of the panel. They push it back from the handle so you don't mar it up cranking the windows up and down. So the big end goes against the door panel. the small end goes against a washer that is very thin and that presses up against the handle to ensure smooth operation. Maybe. That is NOT how I found this car. Springs are on the inside of the panel. At least the driver's door panel. Location: Invermere B.C. Canada - Rocky Mountains No, they go on the outside of the door panel, because otherwise( as you said) they would serve no purpose. Location: Ponder, TX Never had a new FL car, so I can't say where the springs are located from the factory, but all of mine have had the springs under the door panel. The stock board is flexible enough to push the panel outward enough to take up any gap, but if heavier board like Masonite is used as a replacement, it will likely be too stiff to bend. The black plastic disc goes under the handle to protect the vinyl from wear, and they are often badly worn or missing, but I just cut new ones from scrap plastic. I was re-installing my newly refurbed right rear passenger door panel this afternoon and realized that I needed to check this thread regarding the door handle springs. After-reading the thread, I checked the OE door card and found indents from the wide end of the cone spring. So that is how I reinstalled them, i.e. narrow end against the door mechanisms and wide end against the door card. Location: So. California That is the correct installation of them. The small end goes to the metal door, and the big end to the inside of the door panel. It is used to push the door panel close to the handle & escutcheon so that there isn't a gap between the handle and door panel.